Running parallel to the Bukit Timah expressway for the most part, T15 stretches from Chestnut Ave to Mandai Rd (5.8km one way). 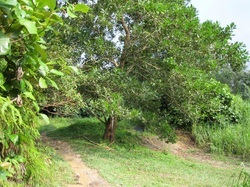 It is a vehicle accessible double trail narrowing at certain parts with gentle climbs and downs. Considered a beginner’s trail and relatively non-technical. It is connected to Gangsa hill, a freeride area adopted by local freeride group Se7en with jumps, berms and slopes for big air time, Gangsa hill is recommended only for expert riders, and use of appropriate protective gear (guards, helmet) is mandatory. With the proposed Chestnut Nature Park due in the next few years, with proposed trail additions, there should be more trails for mountain bikers in the pipeline. You may want to enter through Chestnut avenue. Follow the road which will take you under the BKE and back up a long road climb. On your left you should see a green barrier. Carry your bike over the barrier and that would lead you to the southern entrance of T15.